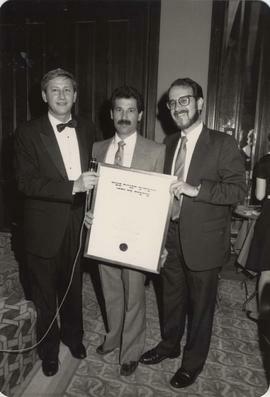 Photograph depicts Rabbi M. Cohen and two unidentified men [unclear which man is Cohen] holding a framed certificate. Photograph depicts Rabbi W. Solomon in the centre with two unidentified men on either side of him. They are holding a certificate.Written on the verso: "Wanted for B. Isr. B-4 April 16/87." 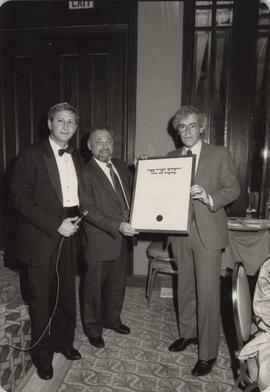 Photograph depicts three unidentified men holding a certificate. Photograph depicts two unidentified men holding a certificate.